Mayamalavagowla is the 3rd raga in the 3rd Chakra – The Agni Chakra. Three kinds of fire is stated in the Vedas – Dakshina, Ahvaniya and Garhapadya. The mythological trinity are Brahma, Vishnu and Siva. In Mind, Body and Soul Chakra – Chakra 3 is Sacral or Kundalini Chakra which rules over the pleasure centers. Ragas are believed to affect various “chakras” (energy centers or moods) in the path of the Kundalini. Aptly Mayamalavagowla belongs to the Sacral/Kundalini Chakra. Singing this raga in alignment with the Sruthi and with complete devotion leads to spiritual enlightenment or illumination. It is the 15th Melakarta ragam in the 72 melakarta raga system of Carnatic music.It can be called the gateway to Carnatic music. Mayamalavagowlai is one of the most auspicious raga among the melakartha ragas.This auspicious raga evokes shantha rasa ,piety and is majestic too. The raga has a totally relaxing and meditating effect.The raga sounds divine and also evokes Bhakthi rasa. This ragam corresponds to Bhairav That of Hindustani music. This raga is mentioned in Sangita Ratnakara and is held in great reverence as it is an ancient raga. The original name of this raga is Malavagowla. “Maya” may be the Katapayadi prefix to make its number 15 in the 72 melakartha scheme. Maya also means the mother, denoting the Goddess of all that is beautiful and enchanting. There is therefore elegance and enchantment in its very name. Venkatamakhi in his Chathurdandi Prakashika referred to this raga as Suddha Gowla. This raga is the Suddhamadhyama counterpart of Pantuvaralai the 51st mela. This is a raganga,sampurna and sarva-kalika raga/all time raga. The raga admits nearly 90 janya ragas. Some of the most popular janya ragas are Malahari, Bowli, Saveri, Nadanamakriya, Gowlipantu, Lalitha, Revagupti etc. Mayamalavagowla is generally prescribed for Shishir Rithu-the auspicious Dhanur Masam. The atmosphere is charged with religious fervour matching with the divine character of this raga. There is a fine blend of vibrancy and subtlety of Tandava and Lasya elements in this raga. Perhaps the raga has the flavours of both the regions Malava and Gowda. It is the only Sampoorna Raga that has four pairs of notes with an interval of semitone between each pair, one Komal and the other Tivra as per Sri.S.R.Janakiraman. The history of Carnatic music says that the system of Mayamalavagowlai was introduced by the blessed musician, Purandaradasar. This raga has the potency to neutralise the toxins in our body and hence it is recommended to be sung everyday in the morning. Practising this raga in the early hours of the morning, in the midst of nature, will enhance the strength of the vocal chords. The specialty of this raga is that it is the best for the vocal muscles and a continuous practice of this raga will give a rich and rounded tone to your voice. There are several voice culture exercises in this raga. srgmpdnS- gmpdnSRS-SndpdnS- SndnSRGR-GMGRS- Sndpmg-gmpdm,grs- sndn,,s- pdp”m- gmddpmgrsn-srgmpddpm- gmpdn,dpmgr-gmpdnd,-gmpdnpdp mpdpmg rgmgrs sndn,,s. Why Mayamalavagoula is chosen as the basic raga? This raga invokes bhakthi and devotion and is apt to be sung in the mornings. Though it can be sung at all times the raga is most soothing during the morning hours and the mood it generates is just like a few drops of refreshing morning dew outside the window to begin the day with a positive note. The student should note that all the varisais and alankarams are set to this particular raga mainly for 3 reasons. Improves the tonal quality of the singer (helps to develop open throat singing). It also initiates the students to the concept of tala or rhythm. The following features of the raga make it an ideal one for the initial lessons in music. The two notes s-r, g-m, p-d and n-s are played on contiguous swara sthanas in Veena. This raga admits janta swaras and dhatu swara prayogas in quick time and slow time. It is a sarva swara gamaka varika rakthi raga. All forms of Jantai, Dhattu and Pratyahata gamakas(SN ND DP PM ..) feature in this raga. A janaka raga claiming a large number of janya ragas. This is a mela raga with pairs of symmetrical tetrachords.This is a raga free of all doshas. Tristayi Raga. The perfect balance of Purvanga with Utharanga makes the raga simple but yet complete. This raga accomodates all sorts of musical forms like varnam, krithi, tillana,folk tunes, tevaram,ragamalika etc. Compositions of all types, heavy, as well as light, exist in this rAgam. The first krithi that comes to my mind is Deva Deva kalayamithe composed by the Royal Composer Maharaja Swathi Thirunal. Tyagaraja has composed many krithis in this raga. Merusamana,Tulasi dala mulache, Devi Sri Tulasamma,Rakshimpave, Vidulaku mrokkeda sangita etc to name a few. Merusamana and Tulasi Dala are all time favourites of musicians. “Adikondar antha” by Muthu Thandavar is a brilliant composition that gives an instant liking for the raga and the pleasant mood it creates.”Shrividya vedya by Muthaiah Bhagavthar belongs to the group of Chamundeswari AshotharaSatha Nama Krithis composed by him. Almost all vaggeyakaras have composed in mayamalavagowla. The raga easily bends for raga alapanai and neraval renderings. This raga gives the same feeling of going to one’s mother’s home. How do we feel when we see our mother ? Pleasantly happy, soothing, soft, kind, patient,compassionate,graceful,sweet, balanced, ideal, perfect etc..All these words matches describing Mayamalavagowla. The grand krithi “Sree Nathadi Guruguho” by Muthuswamy Deekshithar is the most favourite composition that I would like to hear again and again. This krithi is Sri. Muthuswami Deekshithar’s first composition. As per his Guru Chidambaranatha Yogi’s advice, Deekshithar visits Thiruttani temple(Abode of Lord Subramanya). It is said that Lord Subramanya gives Darsan to Dikshithar and places a sugar candy on his tongue and it was from that moment Deekshithar started composing krithis. There in a deep meditative state Sri Dikshitar sang his first composition “Sri Nathadi Guruguho Jayati Jayati”. This krithi is composed in Mayamalavagowlai, the first ragam-Abhyasa Gana Raga. Deekshithar beautifully starts with the Arohana Avarohanam of this Raga in the very first line. Aarohanam and Avarohanam of Mayamalavagowlai is sung in all 3 speeds, within the first Sangathi. He has shown use of plain notes, Janttai notes and Gamakam, which brings out the beauty and structure of the Ragam. In Anupallavi and Charanam, all lines end with different swara, which helps to get perfection in each Swara Sthanam of the Ragam. Dikshitar has incorporated Sarali, Jhanta, svara Varisai’s in Trikalam in the Pallavi lines, and the Alankarams in Anupallavi. Sri Nathadi Guruguho is the first Guruguha Vibhakthi Krithi composed by Dikshithar. This marked the beginning of his life as a Great Composer of Carnatic Music. He composed all his Krithis with Lakshya, Lakshana, Sangeeta, Sahitya and great devotion. In honor of his Adi Guru, Sri Subramanya, Dikshitar chose the Divine name of the Lord “Guruguha” as Mudra in all his compositions. Thus the first set of Krithis is called Guruguha Vibhakti Krithis. The composition is sedate, serene and conveys the bhakthi in offering the prayer. The krithi emphasises on doing Pooja with Tulasi leaves. The krithi fits in the early stages of the concert and is open for elaborate ragalapana, neraval and kalpana swarams. The krithi builds the tempo in the concert and brings in a pleasant and refreshing feel to the audience. In the Krithi Devi Sri Tulasamma Tyagaraja says that Gods like Brahma and Indra have attained their greatness by using Tulasi in their worship to Lord. He further eulogizes Tulasi by saying that Sankara, Vishnu and other dieties will not accept any offering which is not purified by this sacred leaf. The saint poet says, Sri Hari could not be counter balanced without Tulasi. Let us remember the story of winning Krishna by Sathyabhama with all her jewels or winning HIM by Rukmani with just one single Tulasi leaf. Such is the purity of the sacred leaf. 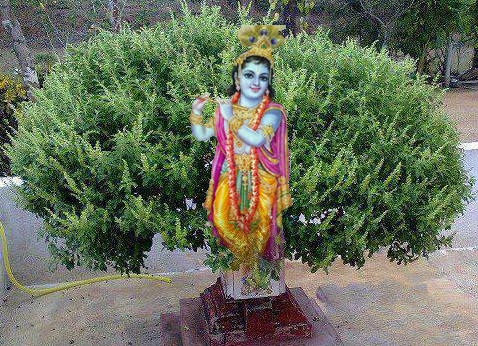 Without Tulasi, the Lord would not merit the appellation “Vanamali”. Who can be in par with you ? May be Tyagaraja reminds us through his krithi that Tulasi is earthly manifestation of the goddess Tulsi, a consort of the God Vishnu. Tulsi symbolises purity.VishNu is supposed to take abode in a house where tulsi is grown. May be it is because of this reason that Tulsi is grown in every home. Tyagaraja aptly uses Mayamalavagowla raga, the raga generally sung in the morning (though it is a sarva kalika raga) to describe the importance of worshipping the Lord in the mornings with the sacred Tulsi leaves. It is said that the wind that touches a tulsi plant while it blows, gives rise to sacred thoughts, spiritual upliftment and goodness and purity to the mind. It is only because of these ennobling qualities that tulsi occupies an elite position in the spiritual world. are worth mentioning.The film songs uploaded has an instrumental version of Tulasidalamulache by Illayaraja. A few Malayalam songs are also added to the collection. Oh Lord of the celestials I pay obeisance at your lotus-like feet ! Oh sovereign of the three worlds ! Please do obliterate all the miseries of this worldly life by your infinite compassion ! Oh Ramaakaantha – the husband of Lakshmi ! You are adorned with a golden raiment ! Please obliterate the sins I have accumulated in my previous births you your grace. You vanquished the clan of demons. You are the refuge for the dejected ones and the celestial. Please protect me ! Oh Lord Padmanabha Saure! Concluding this review by making a humble remark that Mayamalavagowla is gentle, soft, meditative and ethereal by nature. The melody the raga create softly floats in us like the clouds towards the heavens. It lift your spirits, make you more alert and help you focus.No wonder this was chosen as the first raga for the beginning exercises in music. ! Thanks for your efforts and excellent job done. In Mayamalava Cine Song collections,-Solladi Abhirami – Aathi Parasakthi – Tamil Movie Song-is available for few seconds only and not the full song. If you could please look into it and rectify. Regret for the inconvenience caused. Sometimes this happens. I think this song is available for free download. I downloaded it and got the link from google search. Kindly google and download the full version. The idea is mainly to highlight that the song is in this particular ragam. Could you tell me who introduced Mayamalavagowlai as the raga for basic carnatic music lessons? Please read this Raga appreciation on Mayamalavagowlai..It is Purandaradasar..It is written on the very same page. Think you missed reading it..
Raja Sir has composed hundreds of songs in this Mayamalavagowla. Right from his first film, Annakkili he has been composing one song for one film almost till 2000. His first film song, SONTHAM ILLAI BANDHAM ILLAI VAADUTHU ORU PARAVAI. the orchestration will give you the exact mood of the situation as well as the dimension of sad mood of the ragam. Raja sir is the only person who has used this ragam elaboratedly in many of his compositions with various even more than 9 rasaas ! I shall upload a list of beautiful songs in this ragam later; if you permit me. Even one Mr. V.S. NARASIMHAN, has composed one beautiful song VIZHIGALIL KODI ABINAYAM in the film Kan Simittum Neram. Maam the download link is no working. I wanted to introduce my baby to the music. Please arise me on where I can find them? All files are being shifted to a new server. Links are undergoing updation process..Visit often and check.. Excellent!!! I’m fortunate to have come across your blog which is just SUPERB.Every rasika must acces your blog which is like an Encyclopedia in Carnatic Music. mam can i have few semi classical songs from this raga?